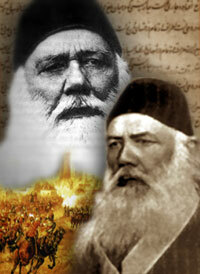 The influence of Syed Ahmad Khan remained on the whole confined to India. It is probable, however, that he was the first modern Muslim to catch a glimpse of the positive character of the age which was coming. The remedy for the ills of Islam proposed by him, as by Mufti Alam Jan in Russia, was modern eduction. But the real greatness of the man consists in the fact that he was the first Indian Muslim who felt the need of a fresh orientation of Islam and worked for it. We may differ from his religious views, but there can be no denying the fact that his sensitive soul was the first to react to the modern age. The extreme conservatism of Indian Muslims which had lost its hold on the realities of life failed to see the real meaning of the religious attitude of Syed Ahmad Khan. I admire anyone who looks - with conscious intention - into how to maintain an integrity...instead of merely retreating into the past or passively accepting what the modern age may offer up. Does this describe Syed Ahmad Khan? @Robert: Yes, in my opinion Sir Syed Ahmad Khan can be described as that. Also to be remembered is Iqbal's warning that the real meaning of Syed's religious attitude remains undiscovered. @ Khurram Ali Shafique, thank you for this. Hmmm...my interest is now peaked. I need to know more about Syed Ahmad Khan. I feel Syed Ahmad Khan was wrongly labeled by some as rationalist; he actually went beyond the rationale of things which made him the first genuine thinker on the matters of religiosity.